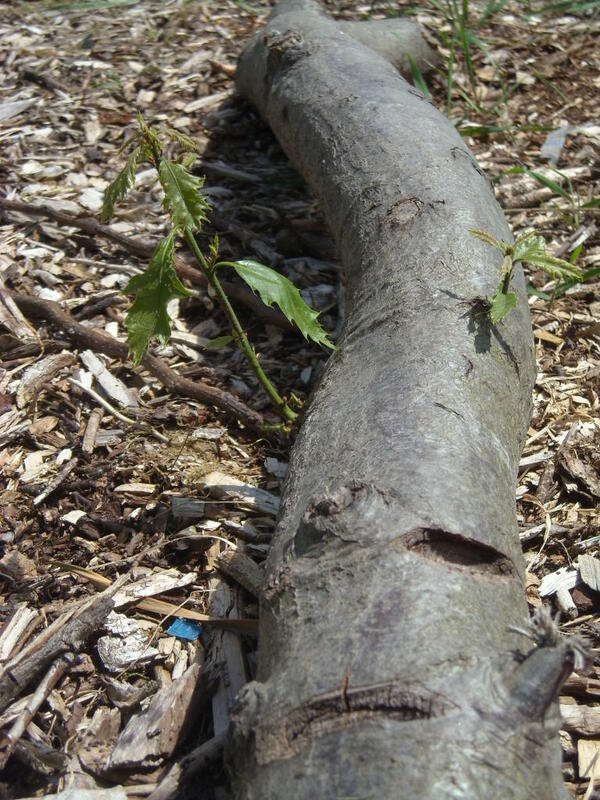 The photo shows new sprouting on this oak log that was cut last fall. It was a reject from the mushroom inoculation event because it was too small. It’s still alive! That’s persistent. 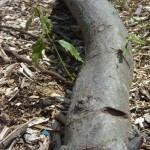 Scientists please add to the conversation, but one explanation is that the cut wood forms a new meristem, which allows the growth of new organs (leaves, flowers, roots). 1) The blackberry patch is gone! It took four work parties and a lot of wrestling and forking to get at those roots. 2) We finally finished our Community Design Grant and our report was accepted. Please celebrate those volunteers who put in more than 20 hours toward administrative work for that grant: Justin Hansen, Joan Davis, Nancy Helm, Dana Spindler, Max Menchaca Dean Wenick, Ruth Callard and Michelle Perham. 3) The new construction grant application has been submitted. After much searching for cost estimates, talking with other garden representatives, and appealing for volunteer labor and material commitments, we are seeking $43,000 to add a water system, a shed with water catchment, garden plots and a crushed rock path, including ADA features. How wonderful it will be to keep supplies at the orchard. 4) We finally have WSDOT review for many of the design features that the public desired. It will still take many more months and possible permit costs but we should know soon which features we could add to serve the neighborhood. Thank you to everyone who had a part in the success of the last 12 months. Should we be awarded another matching grant from the Seattle Department of Neighborhoods, we will likely begin construction in September. Your volunteer time is worth $20/hour toward the total $43,000 match for the 12-month construction period, beginning August or September this year. Any volunteer hours put in from May 5 forward count toward our grant match. Please keep us up to date on your volunteer hours. You can email them to Joan or Ruth or add them to the Volunteer page on the website. Every hour counts! If you have specialized skills to donate, we can count them at market rate per hour. If you shop for orchard materials or supplies this year, know that you can print out our P-Patch Trust 501(c)(3) letter from the Volunteer page on our website and take it with you when you ask for a non-profit discount. 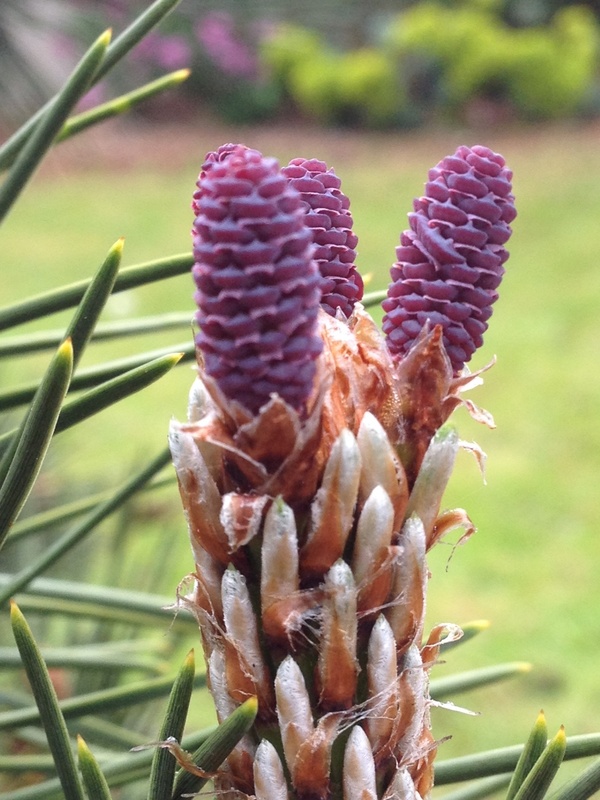 The Japanese Pine was flush with pine cones last week. 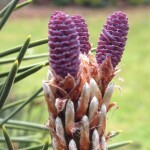 The cones are only1/2″ tall! This entry was posted in Grants & Fundraising and tagged blackberry, grant, match, volunteer on May 16, 2014 by Ruth.